In past blogs, I've passed on my favorite recipe for Oyster Stuffing, written one thing or another about; turkeys, hams, sweet potatoes, mashed potatoes, corn casseroles, stuffings, external dressings, gravies, pies, and appropriate wine pairings, for Thanksgiving and/or other holidays. Often overlooked however, are those savory morsels which encourage socialization before the main meal. I'm, of course, referring to the appetizer. The appetizer is typically a morsel served before a meal to either stimulate the appetite, or keep Uncle Verne and the kids out of the kitchen until the turkey's ready. The right appetizer can give guests a chance to mingle and socialize over a nosh, and can set the tone for the rest of the evening. Fortunately, such a bite need not be labor intensive. One can go the basic cheese plate route, featuring three cheeses, each representing a different milk and level of hardness. Thus, a plate displaying; Smoked Cheddar (semi-hard cow's milk cheese), Roquefort (semi-soft sheep's milk cheese), Goat Brie (soft goat's milk cheese), some neutrally flavored crackers/toast points, slices of green pear or apple, and some salty nuts; will keep your guests stomachs from growling until the main meal is served. On the off chance the family cook/chef doesn't feel they have quite enough to do, and they want to serve "fancier" starters, they can prepare Crab Puffs, Oysters on the Half Shell, Baked Brie, or Mini Ceviche. Yet, when there's so much else to do in the kitchen that day, I see such complicated appetizers as unnecessary overkill, especially when, for my money, the quintessential Thanksgiving appetizer is about as basic as it gets. The dish has undergone some major evolutionary changes since then, into the tangy creamy bites we know today. When Deviled Eggs first appeared at traditional Thanksgiving gatherings is unclear, at least I can't find reference to their first holiday appearance. 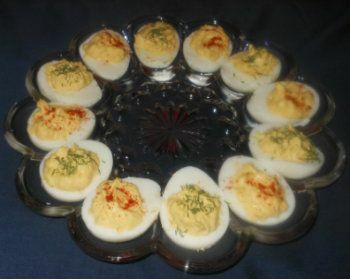 Be that as it may, Deviled Eggs have become such a part of Thanksgiving that in 2009 16,000 people logged onto Allrecipes.com, the day before Thanksgiving, to find the recipe for Deviled Eggs. The basic recipe is extraordinarily simple. Cut eggs in half. Arrange egg whites cut side up on a serving plate and put the yolks in a small mixing bowl. Mash yolks with fork then stir in mayonnaise and mustard. Mash and stir all ingredients together well until creamy smooth. Taste and add salt and pepper if desired. Spoon a little bit of the mixture into each egg white half, dividing mixture as evenly as possible between the eggs. Sprinkle eggs with smoked paprika or dill if desired. Serve immediately or refrigerate until ready to serve. Recipe Notes: Most people find a need tweak this basic recipe depending on a number of factors. If your boiled yolks turn out to be a bit grainier than normal, you'll want to increase the mayonnaise content to reach the desired creamy consistency. Some people adjust mustard levels up or down to suit their taste, or even substitute Dijon Mustard for a spicy kick. Spicy mustards are fine if you need that little extra oomph, but I'd personally steer clear of stone ground mustards just because they'll keep your yolk mixture from coming out as smooth as you want it to. There are literally hundreds of other recipes for the Deviled Egg on Google alone, the above links simply lead to variations which caught my eye for one reason or another. This Thanksgiving you can entertain your guests with the simple time honored version of the Deviled Egg, or mix & match a few of the more creative versions for a more memorable platter. Basic Deviled Egg Recipe prints as page 3 for your fridge or recipe file.